The Department of Technology and iTEAM members (Tech Coaches and Teacher Librarians) are excited to deliver helpful technology-related tips, features and upcoming opportunities in this NEW weekly newsletter! You'll find something each week that will make your life easier and more productive while using district technology - there will be something for everyone! Teachers will find ideas and inspirations for classroom applications, and hear how colleagues around the district are implementing innovative tools, strategies and lesson ideas. 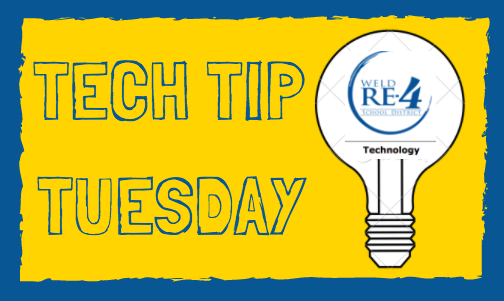 So, be looking in your inbox each Tuesday morning, and feel free to contact us at EdTech@weldre4.org with ideas or suggestions you think would be of benefit to your colleagues!